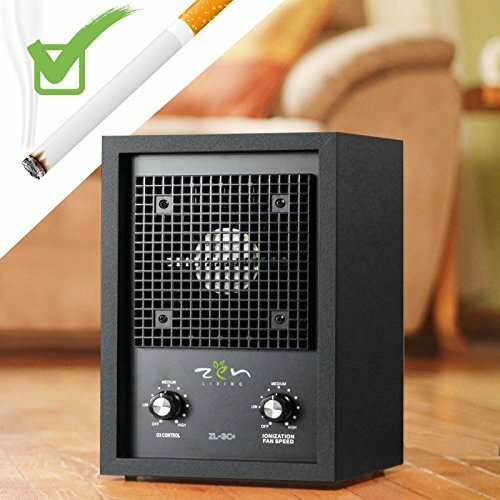 Ozone Generator Air Purifier: Ozone output 500mg/h,Can quickly decompose smell bacteria, germs, and formaldehyde that make air fresh and clean. 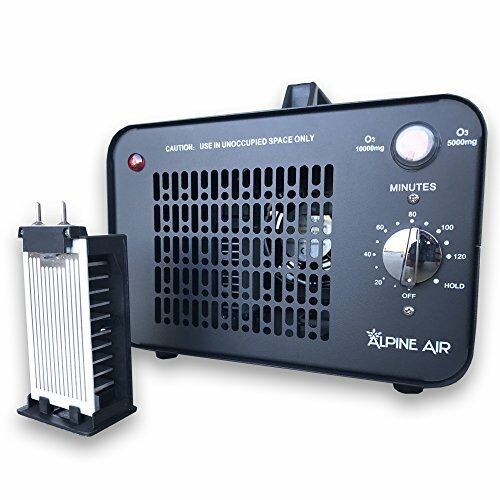 QFL BreathePure 500 Ozone Air Purifier & Ionizer, Smoke and Odor Eliminator, Great for killing mold, permanently remove Dust, Pollen, Tobacco, Pet and musty Odors, Excellent for home and work place. 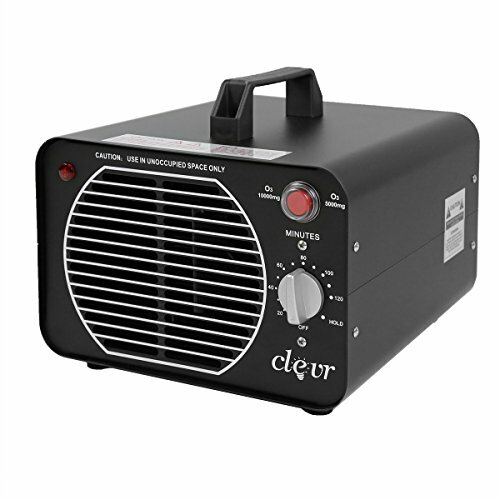 Removes Odor (including pet odor), Smoke, Carbon Monoxide and other pollutants in minutes. 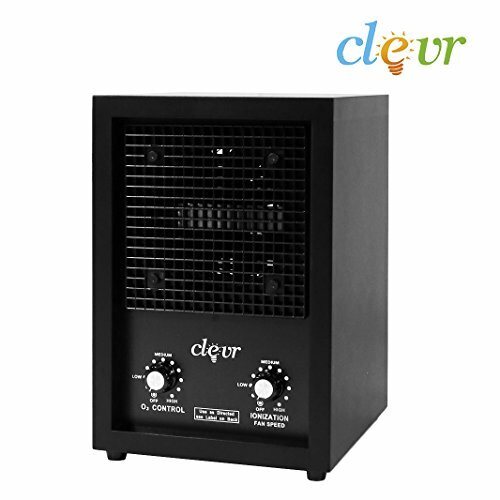 Eliminates dust, pet dander, and pollen. 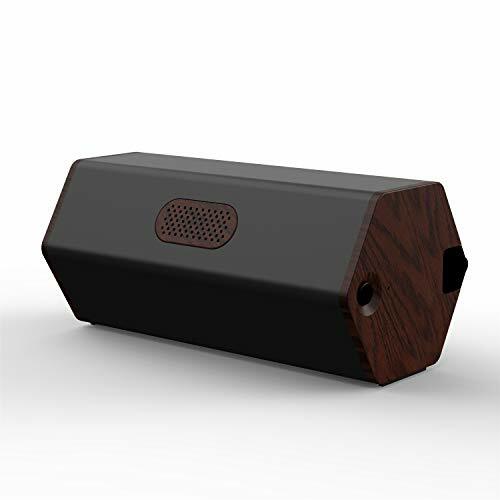 The ozone air purifier creates O3 in a special process that utilizes an electrical current and oxygen. 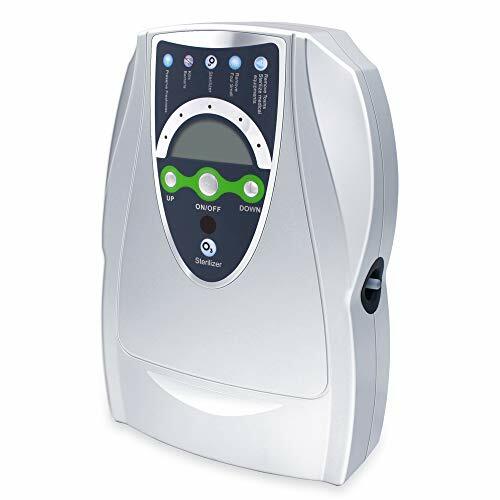 Ozone sanitizes by breaking down odors, micro-organisms and other pollutants at their source. 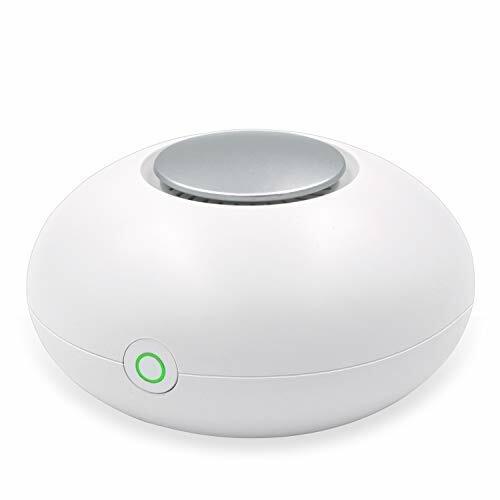 Kills germs, bacteria, viruses, mold and mold spores. No filter needed. 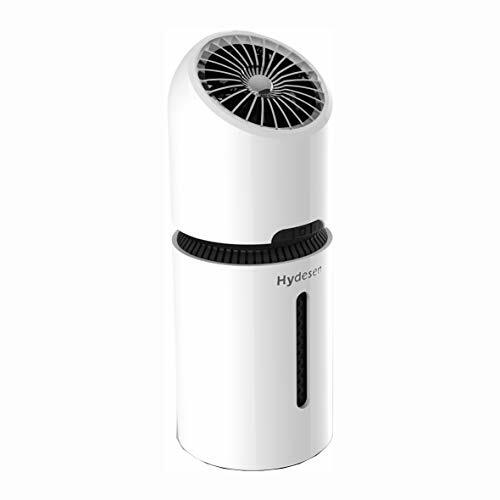 You can easily use our new air deodorizer on a daily basis without changing the filter. 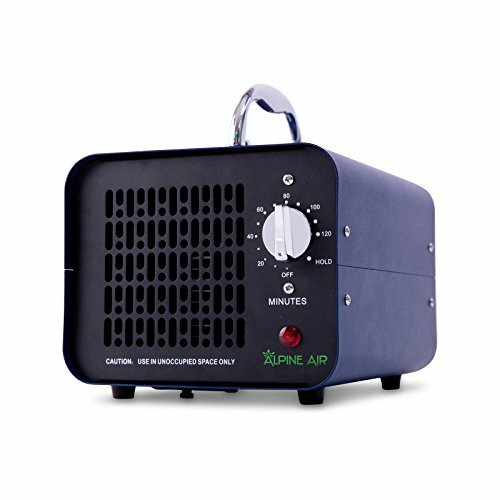 Provides oxygen rich mountain fresh air in your home or work place. QFL professional air deodorizer is professional, heavy duty device which can be used anywhere it may need. 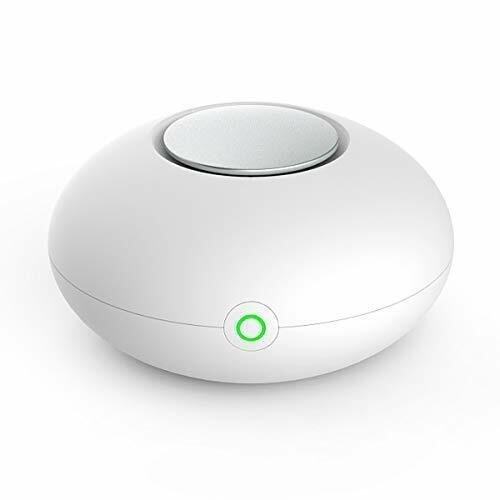 Compact design allows making this air humidifier and ionizer perfect for using it at home in the bedroom, kitchen, garage or anywhere you want. 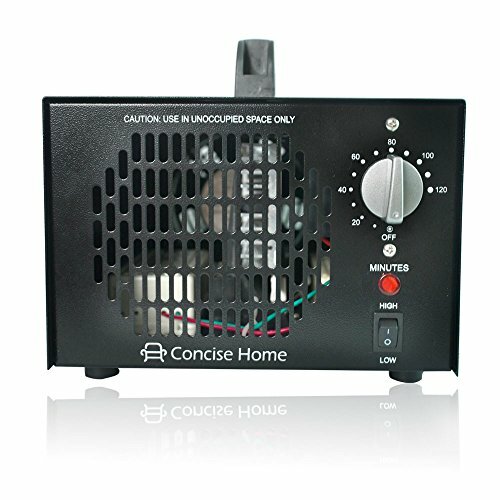 The high quality unit makes it perfect choice for using our ozone generator for big areas like office spaces or commercial spaces. 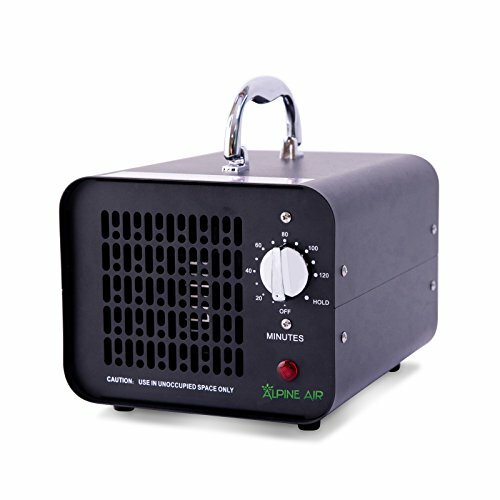 Anytime Anywhere Anything - Our Ozone Generator is portable and lightweight unit, over 500mg/h Ozone production, allowing you to use it anytime and anywhere, suitable for Purifies air, water, vegetable, fruit, bath, utensils, feeding bottle. 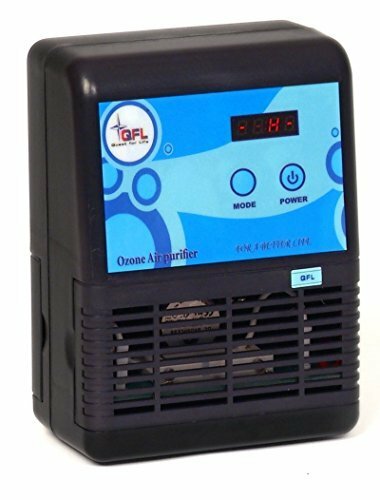 Large Ozonation - Over 500mg/h ozone generator air purifier production, safe Chemical-Free Generator Utilizes Electrical Current to Convert Oxygen (O2) to Ozone (O3), Neutralizing Odors & Disinfecting Surfaces. 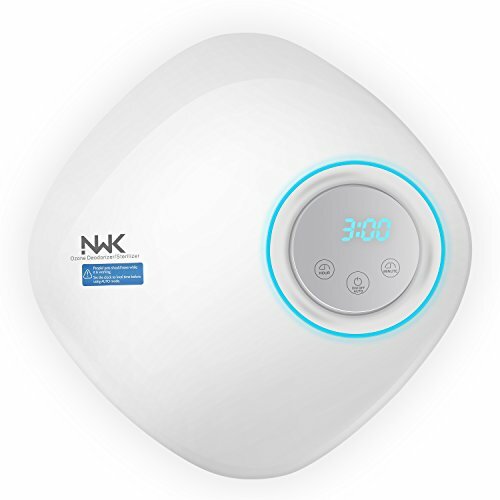 Integrated Timer - 5 levels adjustable from 5mins to 60mins, which are light / 5min, light-moderate / 10min, moderate / 15min, moderate-heavy / 30min, heavy / 60min. 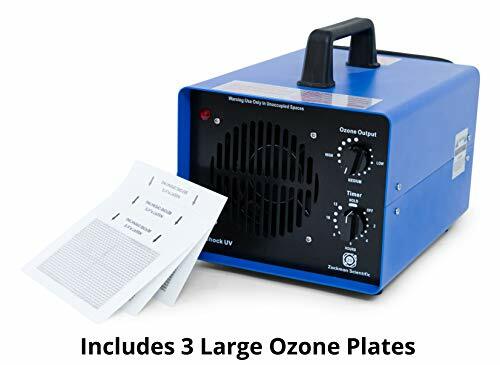 Complete o3 ozone generator package - Included 1 Detachable Oxygenating Tubes & 2 Grey Diffuser Stones for a Variety of Air, Liquid & Solid Applications. 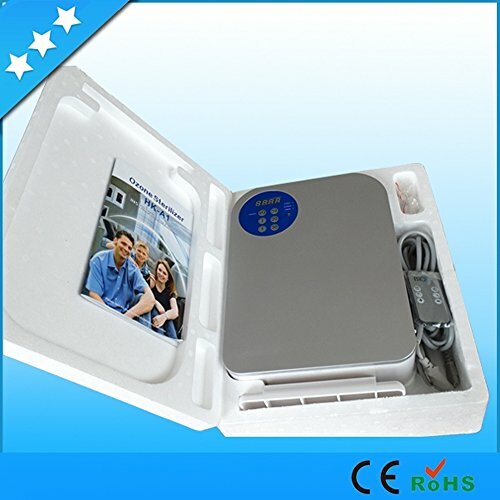 Small & Portable - Unlike others Industrial O3 Air Purifier Deodorizer Sterilizer, ours is small than above, easy to install and convenient to carry out, home kitchen office using, even ozone generator hunting, on vacation, really anywhere you need to sanitize air, water, dishes, food and more. 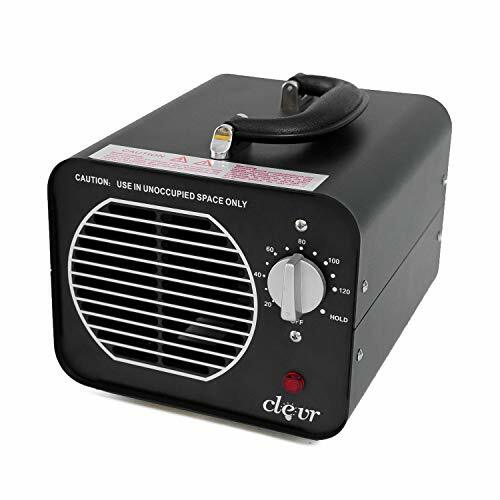 Dimensions Size: 6.75"(W) x 8"(d) x 5.75"(H) - Weight: 4.5lbs - to be used in unoccupied spaces. 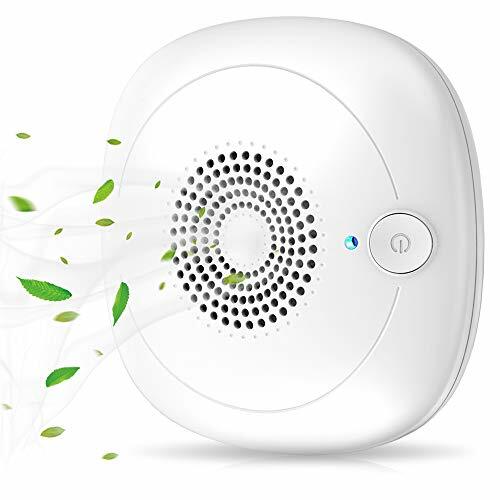 NATURAL ODOR PURIFICATION: Ozone breaks down in about 30 minutes and it is a natural oxidizing agent to destroy smoke stink, strong cooking smells, pet urine odors, musty closets, moldy spaces, etc. 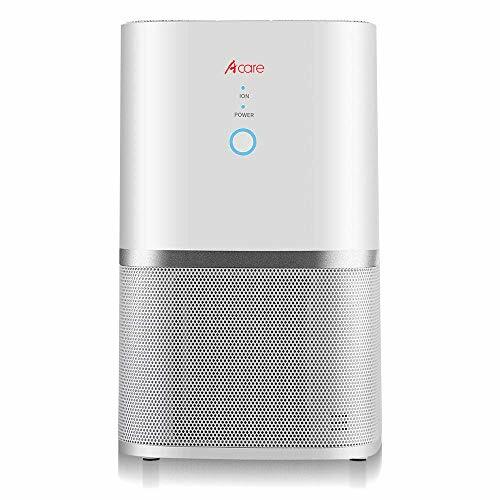 This powerful high end ozone air purifier uses Washable ceramic ozone plate, and Ionic that remove mold spores, odors and bacteria. 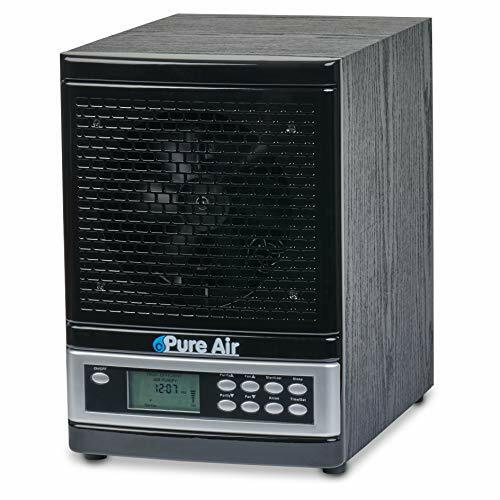 ADJUSTABLE OZONE LEVEL: This air purifier features two knobs to control ion/fan and the ozone production. 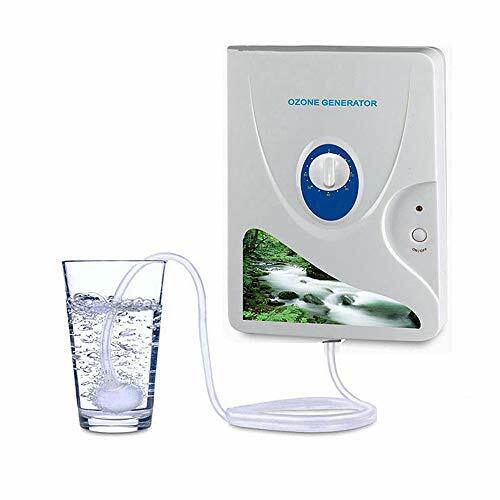 You could use ozone generator and full power mode to remove tough odors and bacteria while you leave; or turn off ozone and use as a ionizer air purifier while you are staying. It covers up to 3,800 square feet of space. 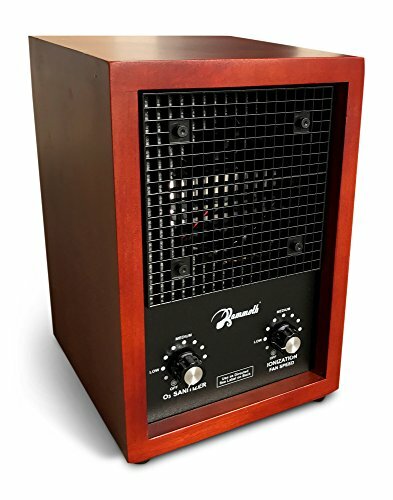 HIGH END & COMPACT: Elegant wood case and only 12 x 9 x 8 inches, makes it look good in any home and perfect for using it at home in the bedroom, kitchen, garage or anywhere you want. NOTE: ALL ozone generators change the molecular structure of the air temporarily, making it difficult to breath when in use. When the ozone feature is turned on, it should only be used in unoccupied spaces (including pets). When people or pets in the room, the ozone switch should be turned off when using. 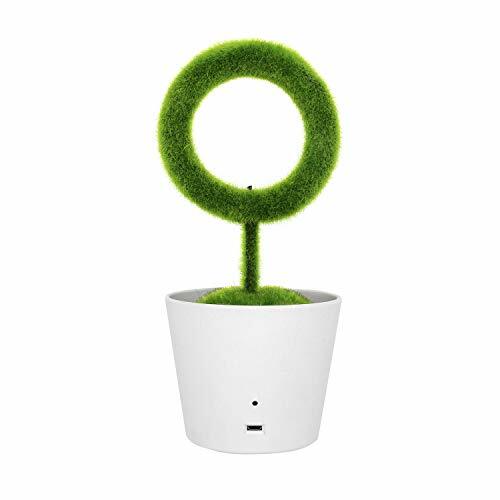 ✿HIGH EFFICIENCY:Take advantage of high voltage, use dry air or oxygen in the air as raw material to produce O3. Eliminates odors, freshens stale air. 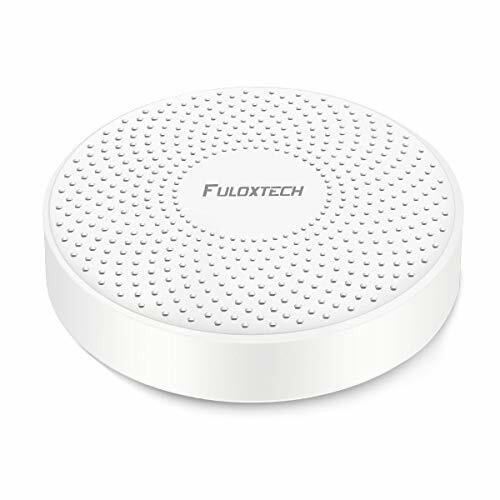 ✿MOISTURE-PROOF PERFORMANCE:Ceramic plate is made of high quality material, has great Moisture-proof performance and long serving life. 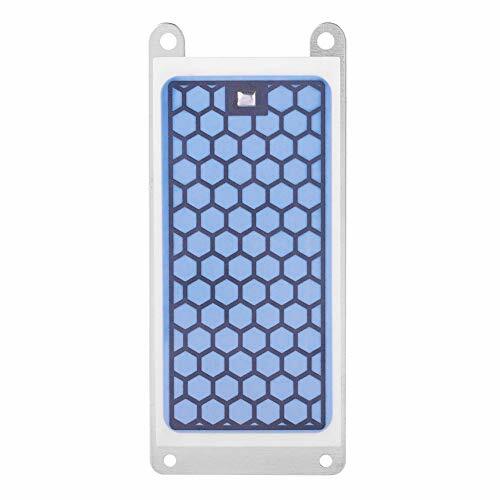 ✿APPLY TO:This Ozone ceramic plate is suitable for 5g ozone generator parts. ✿NEW BRAND:100% brand new and high quality. 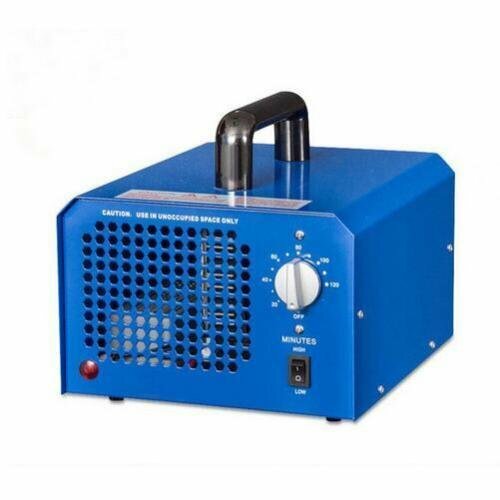 This ozone generator OdorFree will oxidize unwanted odors in your facility. 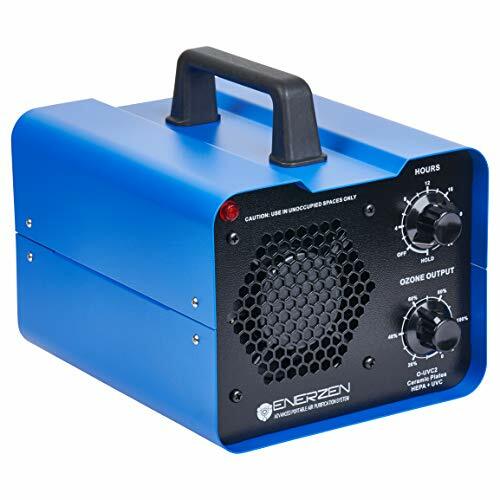 Ozone generators create O3, or ozone, which disburses into the space to be treated. O3 attacks odor causing substances at their source to permanently remove odors in the treatment area. 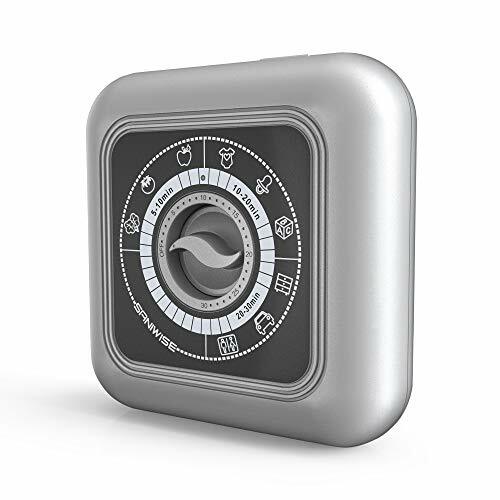 you only need to put it there, open it, and set the time, it will start to work, then will be off after your setting time, when you come back, fresh air will be around you. simple, safe and no second pollution. 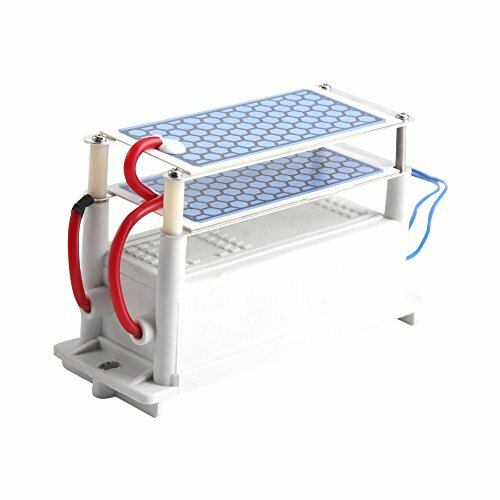 2pc high quality ceramic ozone plate, over 5000 hour working time. CE approved, and offer 1 years factory waranty. Fruits and vegetables sterilizing machine has 5 timing functions to control the length of different types of purification. 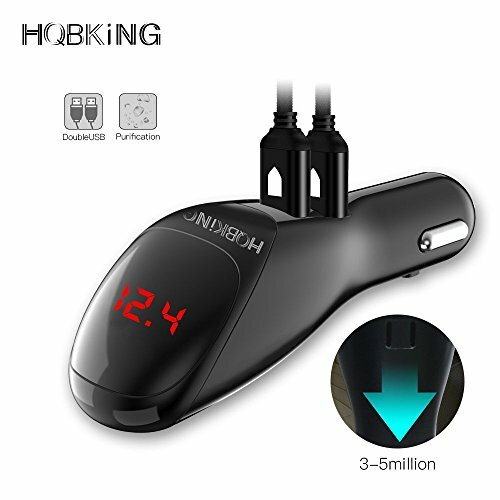 You turn it ON and you can set 5min, 8, 10, 15 or 20. 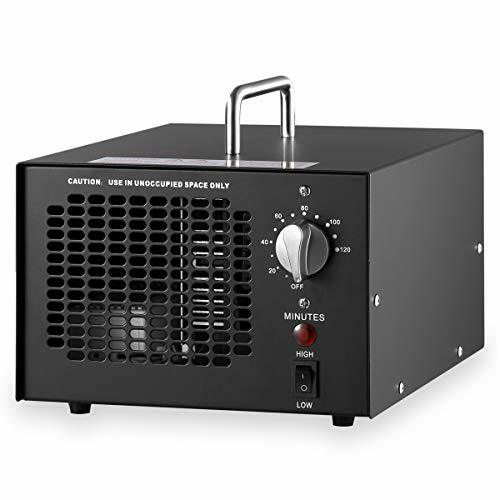 There is a plug( 110V / 60Hz US Plug ) for the ozone generator, with wall mounted design, comes with hardware to mount the ozone generator to the wall. 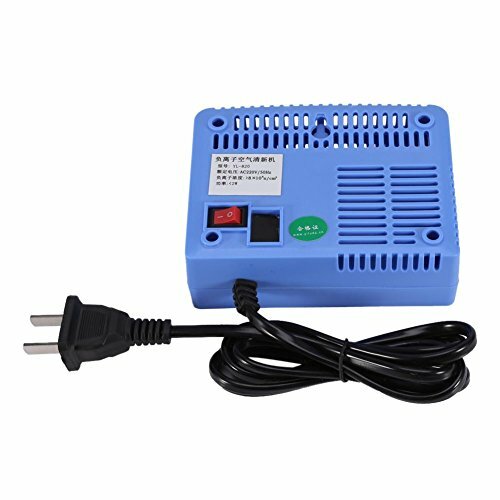 Ozone generator water also can used for skin protection and beauty,hand and feet clean,baby products and toys sterilization and so on. Remove harmful gases such as formaldehyde, toluene, smoke, and painting. 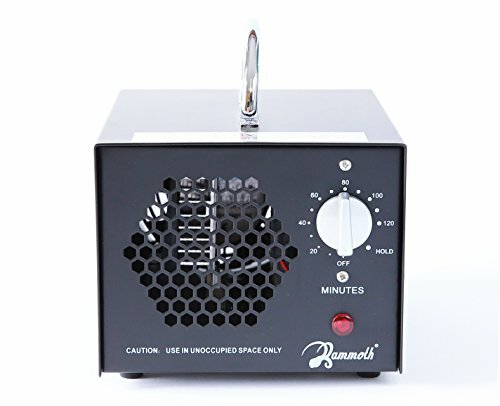 Multipurpose functions meet all your needs and improve your life quality, suitable for home, office, kitchen, restaurant, medical devices, bedroom, wardrobe,hospital. 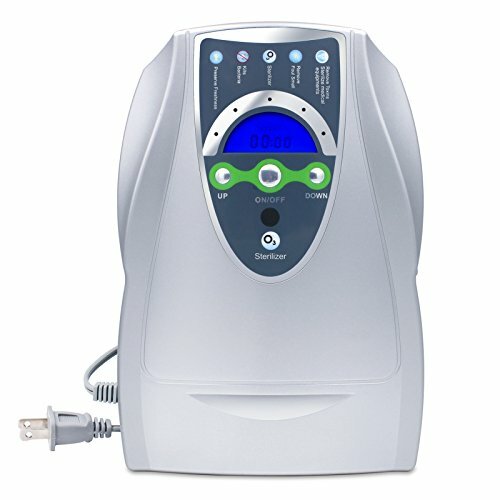 TIP:When used in water treatment, the body height must be above the water, which to prevent back-flow of water from the body causing organ failure.We provide one year warranty including full refund or free replacement if any defective or unsatisfied. 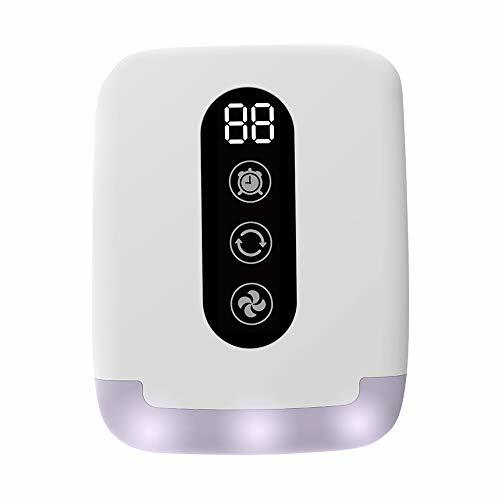 LIGHTWEIGHT, PORTABLE DESIGN - Suitable for home, Office, Kitchen, Restaurant, Medical Devices, Hospital, industrial, and so on,It also can used for skin protection and beauty,hand and feet clean,baby products and toys sterilization and so on. 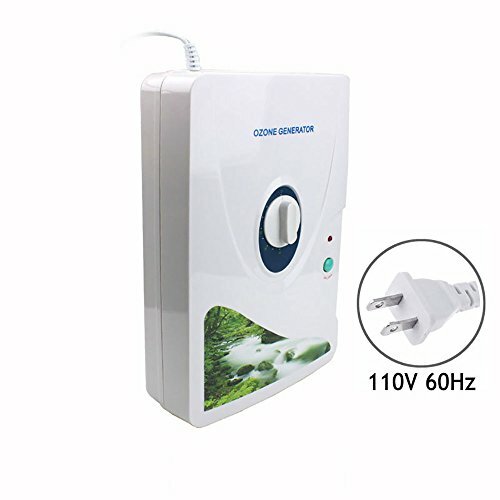 Air Purifier & Sterilizer: This mini plug in ozone generator helps to remove odor, purify air and disinfection. 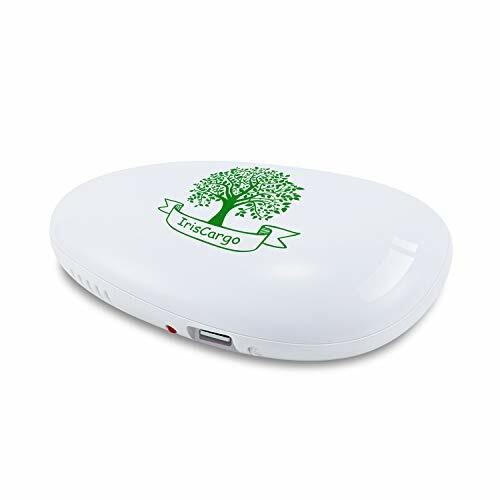 It can efficiently and thoroughly eliminate and neutralize 99% odor and airborne bacteria by converting oxygen (O2) to ozone (O3) which makes you as like breath in the forest. 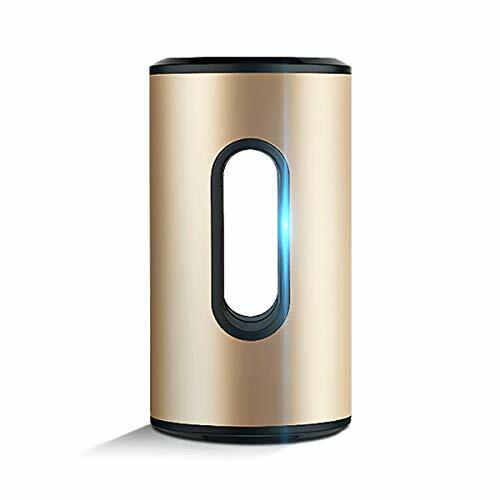 A Wide Range of Application：The Purification area of the mini ozone purifier ranges from 10-30 Square-meter which is recommend to use in kitchen, pet room, bathroom or warehouse to decompose indoor smokes, pet carry germs, cigarette. 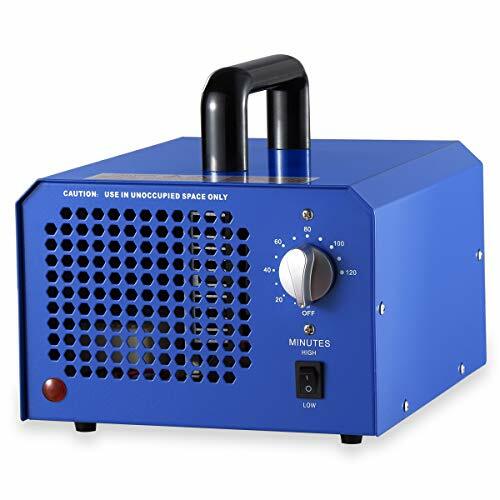 The functions of Ozone are countless like sterilization, detoxification, preservation, deodorization, etc which are beneficial for food storage and human health. 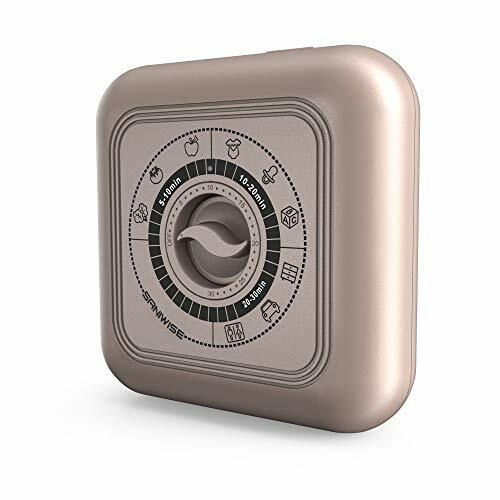 Nightlight& Built-in Timer：Equipped nightlight button, you are able to instantly find the switch if it is used in a warehouse or basement of insufficient light. 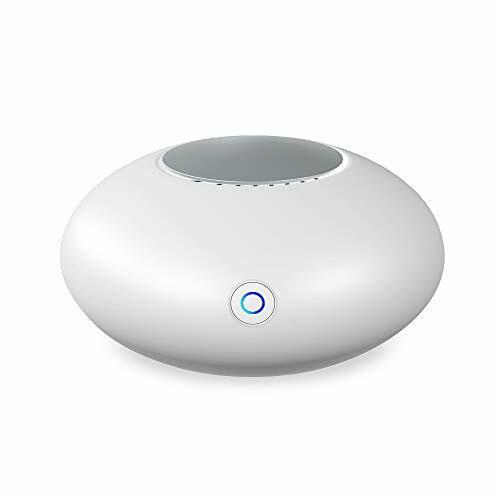 Built-in timer makes this ozone plug in air purifier smarter and more convenient, also, energy-saving. 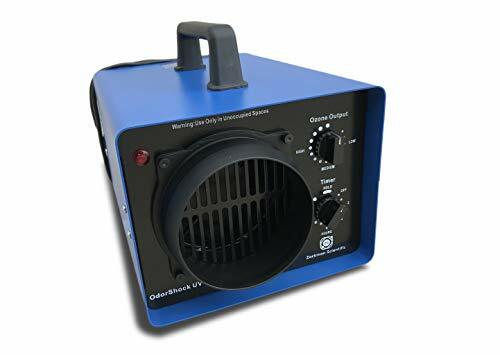 Warranty: Under our 12-month money back and replacement warranty, we take full responsibility of the ozone cleaner, any issues please feel free to contact us on Amazon for the best solution. 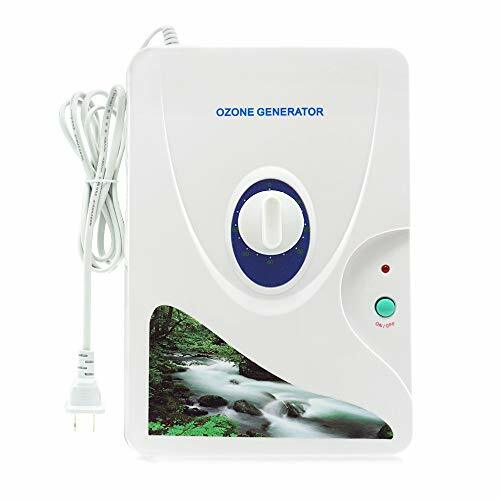 ① Ozone Generator Air Purifier: Ozone output 500mg/h.Can quickly decompose smell bacteria, germs, and formaldehyde that make air fresh and clean. 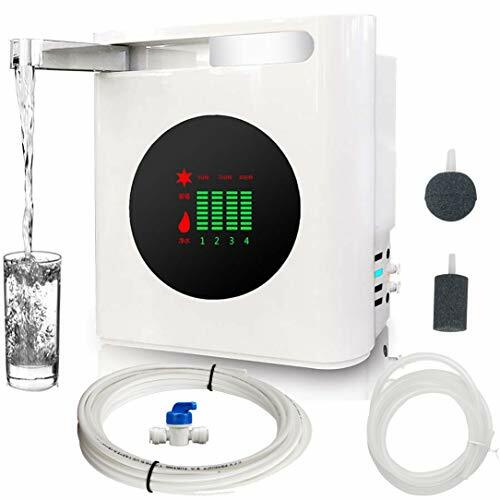 ② Drinking Water Filtration System: Maintain health and wellness: 0.01 micron reverse osmosis ( ro ) water filter membrane removes up to 99% of over 1,000 contaminants, including lead (removes up to 98% of lead), chlorine, fluoride, arsenic, hormones, asbestos, calcium, sodium, bacteria, giardia, viruses and more. 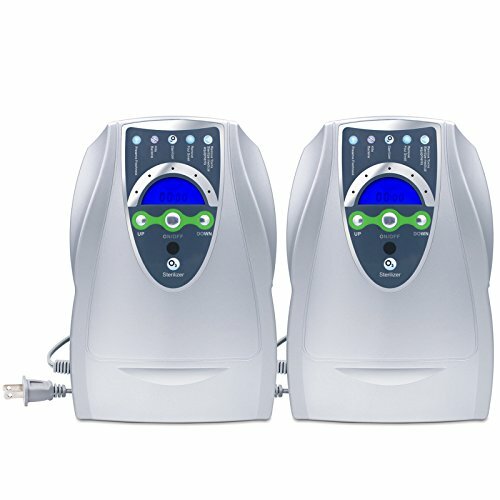 ④ Dissolve impurities and increases water oxygen level; Eliminates pesticides and agricultural chemicals in fruits and vegetables.Suitable for home, Office, Kitchen, Restaurant, Medical Devices, Hospital, industrial, and so on,It also can used for skin protection and beauty,hand and feet clean,baby products and toys sterilization and so on. 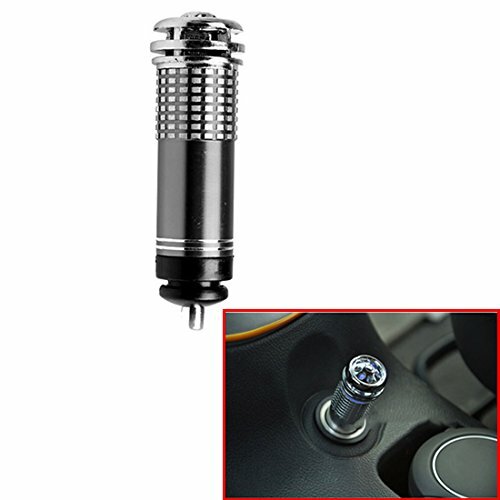 Innovative new car air purifier, it's the original in the world with large negative ions amounts and strong smoke dispellling function. Just try our products and if you don't absolutely love them let us know and we will refund your purchase price NO QUESTIONS ASKED!